I was really proud of my boys yesterday. 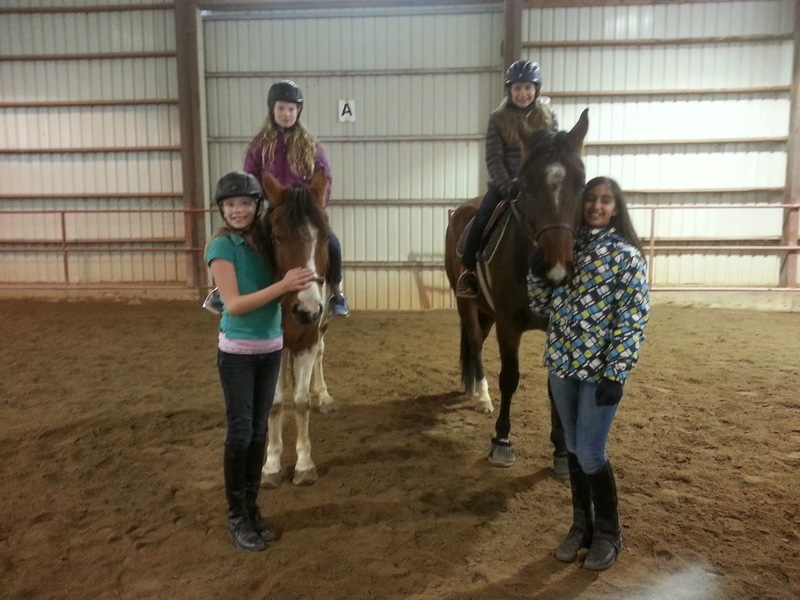 It was V.'s birthday, and she decided that she'd like to have a few friends out to the barn to ride with her. We had three other girls other than her -- one whose experience was on par with V's, and two who had never ridden before. We paid V.'s and my trainer to be there too, which was good because V.'s mom (who is not horsey at all) opted not to go, and I couldn't have handled four girls -- two of them beginners -- by myself. 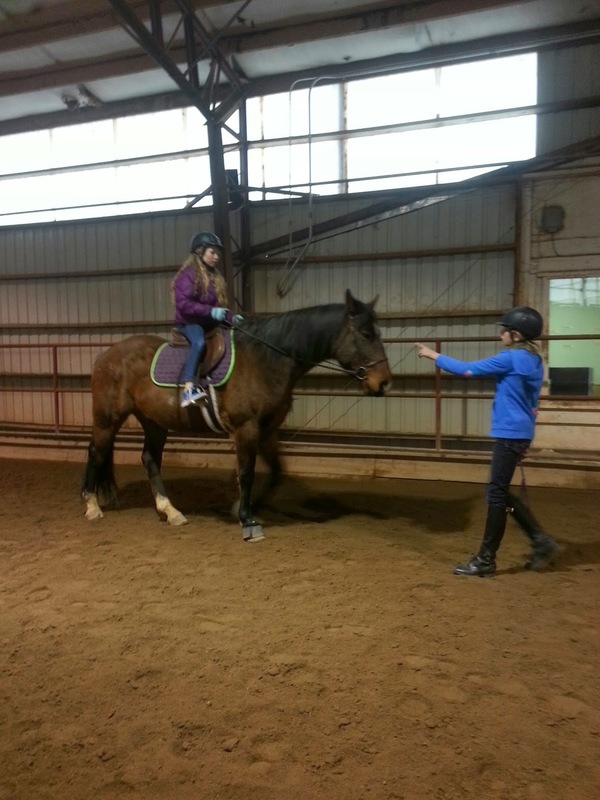 The weather didn't behave, as it was rather cold (after being warmish all week), but luckily we had the indoor arena. It's not very big, but no one else was there, so we had it all to ourselves. Pan has had beginners on him plenty of times before, of course, so I knew he would be good with them -- and he largely was, although he wanted to walk a bit fast for some of their tastes. 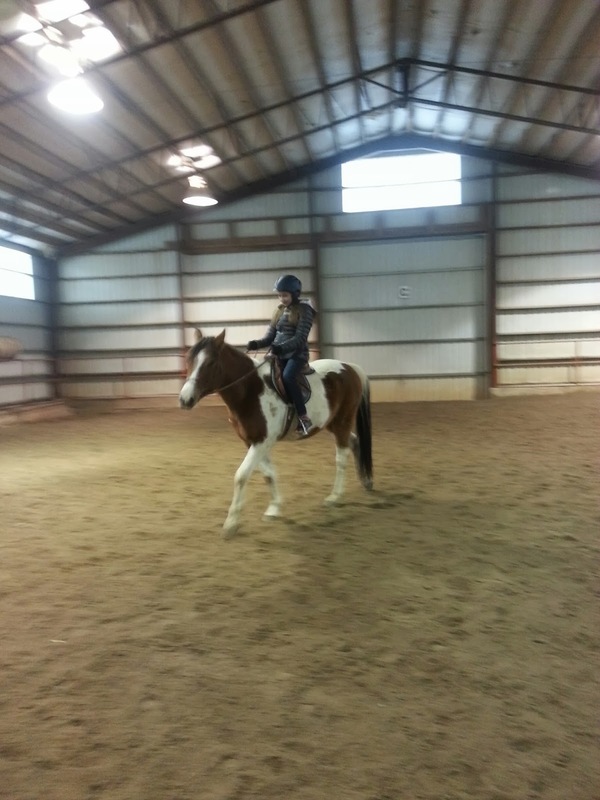 He has a naturally fast walk, which can be a bit alarming to a kid who has never been on a horse before. He also, however, has a very tight walk -- very little dip-and-sway motion, because he is so little -- which I think balances out the speed a little bit. The beginners, especially one in particular, were in Panama's mouth a bit much, but he was very tolerant of it. He also went very well for V.'s more experienced friend, with no theatrics. I was very proud of him. Rondo also did very well. I wasn't expecting him not to, since he is so mellow about virtually everything -- but at the same time, he hasn't had any kids on his back except for V., and certainly not any beginners. My mother-in-law did sit on him once, and I would consider her a rank beginner. He wouldn't move at all for her. There was none of that yesterday: He needed some encouragement, but both beginners were able to get him to walk without much trouble, and V.'s more experienced friend was even able to get him to canter (something that is very much a challenge with in our little indoor arena; with his big and still somewhat uncoordinated stride, he tends to try to ignore canter cues inside). Rondo has really grown up in the past year, and become quite a great riding horse. He still has plenty far to go, but he always impresses me when we throw something new at him and he handles it just fine. As we were getting ready to leave, V. told me it was the best birthday party she had ever had. Undoubtedly we all had a great time, and I was so very proud of my boys for how well they handled it!